Abstract: Acoustic wave resonators have become suitable devices for a broad range of sensing applications due to their sensitivity, low cost, and integration capability, which are all factors that meet the requirements for the resonators to be used as sensing elements for portable point of care (PoC) platforms. 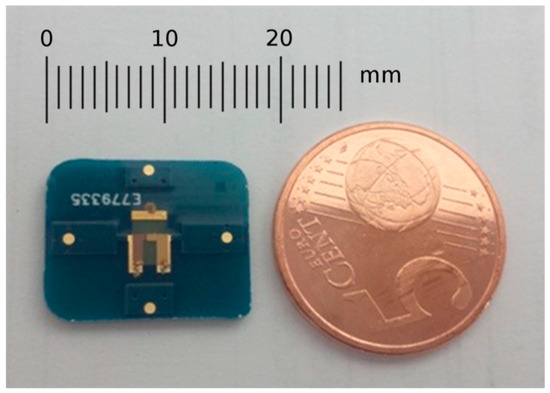 In this work, the design, characterization, and validation of a 150 MHz high fundamental frequency quartz crystal microbalance (HFF-QCM) sensor for bio-sensing applications are introduced. Finite element method (FEM) simulations of the proposed design are in good agreement with the electrical characterization of the manufactured resonators. The sensor is also validated for bio-sensing applications. For this purpose, a specific sensor cell was designed and manufactured that addresses the critical requirements associated with this type of sensor and application. Due to the small sensing area and the sensor’s fragility, these requirements include a low-volume flow chamber in the nanoliter range, and a system approach that provides the appropriate pressure control for assuring liquid confinement while maintaining the integrity of the sensor with a good base line stability and easy sensor replacement. The sensor characteristics make it suitable for consideration as the elemental part of a sensor matrix in a multichannel platform for point of care applications. Just one week left for Biosensors 2016! AWSensors technology will be at the most prestigious congress on biosensing research to be held at Gothenburg, Sweden from May 25th to 26th. We are pleased to invite you to see our platforms at the booth of Bio-Logic, our OEM distributor. There, you will see how our platform works. – Use of different kind of sensors simultaneously. Use of high fundamental frequency acoustic resonators (100-150 MHz) that provides a large increase in sensitivity. Use of a novel method for characterizing these sensors which keeps noise at very low level. As a result, an improvement in the limit of detection (LOD) of 2 orders of magnitude compared to traditional acoustic sensors is obtained. Do not miss the opportunity to check the advantages of our new technology and meet AWSensors founder, Prof. Antonio Arnau. He is coordinator of the International Network of Piezoelectric Transducers Research and Applications (PETRA) and has wide expertise on bioelectronics and acoustic wave biosensors. Dr. Arnau will attend the Post Congress Symposium in Cancer Diagnostics to be held on Saturday 28 May inmediately following Biosensors 2016. AWSensors is currently coordinating LiqBiopSens European Project to develop a new liquid biopsy platform for early detection of colorectal cancer. Spanish Parliament starts to debate today the public budget for the next year. So that, we would like to review what are the plans to invest in research and innovation. According to the budget for the Secretary of Innovation, bioeconomy will be one of the priorities for the Spanish Government in 2016. Bioeconomy encompasses the production of renewable biological resources and their conversion into food, feed, bio-based products and bioenergy via innovative and efficient technologies. AWSensors tech has important applications in bioeconomy such as environmental monitoring, secure food and water, bioenergy or biomaterials. EU is promoting and funding projects in these fields in order to make the transition to a more resource efficient society and the Spanish Government is following this policy too. Spanish government plans to invest 1,765 million euros in direct aid for innovation projects and 2,446 million euros for loans to enterprises. The resources allocated to direct aid will increase up to 15 per cent over this year and loans will decrease to 9 per cent. The government will give priority to areas considered most in need of development in science and technology such as Andalucia, Extremadura, Canarias, Castilla-La Mancha, Murcia, Galicia and Asturias. Among the actions to be undertaken in these regions, Bioeconomy will be boosted in the agri-food, biomass, bioenergy and bioproducts fields. Furthermore, the Centre for the Development of Industrial Technology (CDTI), the main driver of innovation in Spain, will have 30 million euros more for direct aid, 35.7% more than the previous year. The Spanish High Council Scientific Research (CSIC) will have 467 million euros next year and the Institute of Health Carlos III (ISCIII), 165 millions. In spite of this state budget for 2016, Spain is still the 17th european country in gross domestic expenditure on R&D according to Eurostat.